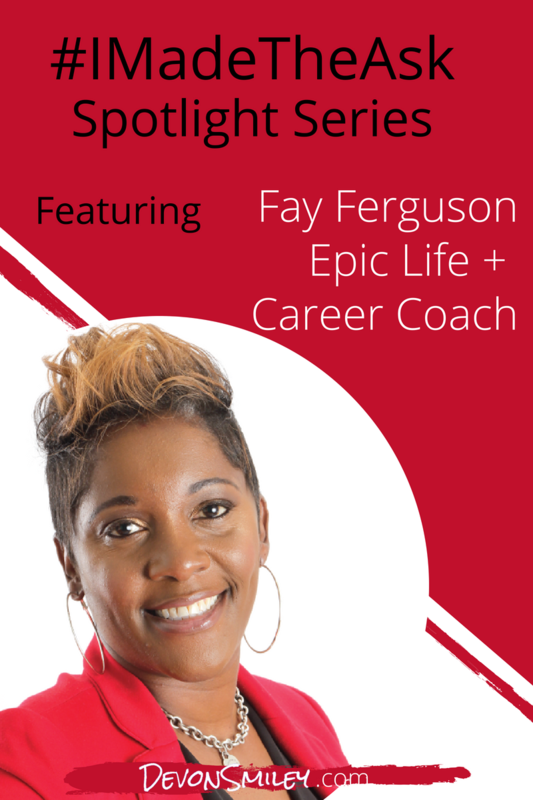 Read on to learn about Fay's business journey, how she's transformed her people pleasing ways, and why what you do after hearing a NO is critical in your career or business. By day, I'm Executive Officer and Workplace Coach for a national agency. I serve as the trusted adviser to senior leadership on business operations, organization development, employee relations and HR activities. I support managers in handling employee performance and conduct matters, effectively. I support staff in being more confident and empowered. I lead a dream team of professionals who advise, execute work and accomplish great things daily. My side hustle/passion is helping accomplished women (and a few good men) get unstuck and kick start the next chapter in their life and achieve what I call epic living... which simply means living a life they love, on their terms. Like my clients, I was accomplished but feeling a tad stuck in my personal and professional life, but decided to take full responsibility for my peace and happiness and kick started the next chapter in my life. I was always bold in my professional life, but a chicken in my personal life. I was the ultimate people pleaser. I had the disease to please, even at the cost of my own unhappiness. Because I was afraid of rejection and being vulnerable, I didn't speak up about what I wanted. I would just get mad and give the silent treatment. So immature, in looking back. Whew! I now speak up and ask for what I want and need in both personal and professional relationships. I set healthy boundaries. That's key. When I returned to the federal government 10 years ago, I wanted the job I'm in now. The job became vacant but I didn't qualify at the time due to the 'grade' system. I asked them to reduce the threshold and make a career ladder position, so that I could apply. It was a hard NO. However, I was told I could assist in some of the activities of the position which I did. I agreed to design an on-boarding/orientation program for new employees. But, once I saw how disorganized that Unit was, I bowed out gracefully. Four short years later, I was selected for the position of not just Administrative Officer, but a name change Executive Officer and took the position and agency to new heights. Asking for the Executive Officer position, being told NO, but working hard in my other positions so that when I was eligible, it would be a no-brainer to be selected. I let them know every chance I got that I was interested and would articulate the vision for the position. Be clear and confident about who you are and the value you bring to the table. Be able to articulate that in a way that's mutually beneficial for all parties and is empowering. This will help making the ask so much easier.